Whilst tying up a black rubbish sack in the garden, I noticed a rather large caterpillar munching its way through the petals of one of my evening primrose blooms. It was munching at a pretty fast rate, and was fascinating to watch. I cast aside my bin tying duties and went to collect my camera. Of course, in situations like this I never seem to have the correct lens attached to the camera, and this time wasn't any different! Once I'd secured my macro lens to the front of the camera, and had performed a quick sanity check on the basic camera settings, I was ready to go. 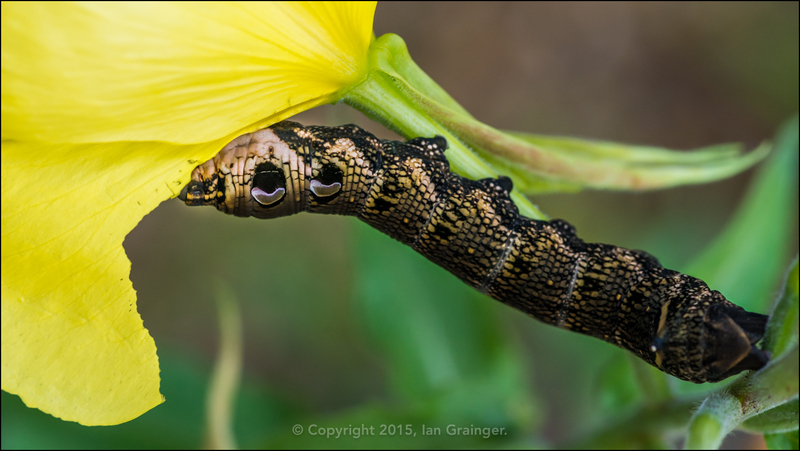 Back in the garden, the caterpillar had moved onto a different bloom having completely consumed the first. Being about three inches in length though he was easy to locate, so I fired off a few quick snaps. After a quick lookup in my British Insects field guide, I identified the leviathan as the Elephant Hawk Moth (Deilephila elpenor) caterpillar.